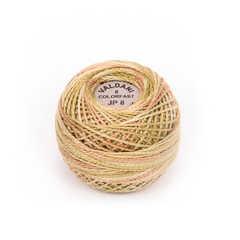 Exceptionally beautiful Perlé Cotton thread by Valdani in Gold Green JP-8. Hand-Dyed in Lead-Free Dyes and Guaranteed Colorfast for any Embroidery, Quilting, or Appliqué. Sale Price $1.99 reg $6.00. 60% off!